What’s next? What happens after your travel year? Everyone’s asking us the same question so I figured it was time to answer it. Now that we have sampled a series of 3-month relocations around the world in 2013, we’ve decided to test living in one of them, Bangkok, for longer. What’s “longer”? Well, another 12 months, of course! We can’t stop now!! – 2013 was hands-down the best year of our lives so far. Jettisoning the predictable grind of our Northern Californian lives and taking off on the adventure of our lives was the most invigorating thing either of us had done. There is something about intentionally designing a new life in a new place that is extremely fulfilling. Previously we had basically accepted the default life options that were right in front of us. When we decided that was a dead end we took off on our 2013 world service trip. We have not once regretted it. We are going to continue rather than return to the old. Meaningful service opportunities - Intentionally taking out a year of our lives for service has only given us an appetite to do more of it. In the last few weeks we have hunted down a whole range of volunteer activities for next year. In addition to our original Bangkok projects (orphanage and prison visits), we may be adding visits to refugees in their homes, volunteer journalism projects and high school teaching. Unbeatable continued travel options - We are definitely not done traveling. The only thing that is changing is the model. Bangkok is the ideal hub for discount flights anywhere in Asia (and, coincidentally, anywhere in the world) because of its popularity as a tourist destination. In 2014 we plan to make Bangkok our base but be able to visit other parts of Asia on a frequent basis. This may actually end up meaning more travel than we did in 2013. A job offer I could not refuse - I’ve said in previous posts that this year has brought a lot of really interesting job opportunities our way. I want to say a big thank you to all the CultureMutt readers that have gone out of their way to provide us with these opportunities. You guys are amazing! We really appreciate your looking out for us! There was one offer I simply could not refuse: Business Development for a US-based educational company. More details on this job will have to come in another post but for now I will say that it is a dream come true and will allow us to make a solid living during our 2014 Bangkok Experiment. Thanks for this opportunity goes to yet another CultureMutt reader. You know who you are. Thank you for sharing our vision and appetite for service and global adventure! Quality of life for a lot less. Nowhere we have lived (or heard of) allows you to live as well as you can in Bangkok for so little. 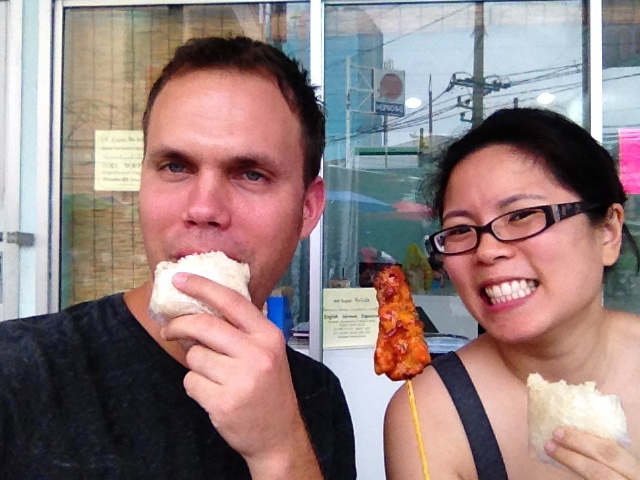 The extremely low cost of living in Bangkok allows you to save more easily than anywhere else we’ve lived. In a world where it is hard to get a job and often even harder to make ends meet, let alone save, working in Southeast Asia offers an amazing alternative. If you have a degree from a Western country and a little bit of work experience under your belt, the job possibilities in a place like Thailand are endless. Thousands of Westerners live and work in Bangkok for this reason. There is more work, you can often find decent pay and your living expenses are (even conservatively speaking) a third of what you were spending on scraping by in the US or Europe. I have gone over actual dollar figures and why it makes a lot of economic sense to live in a country like Thailand before but if you want a brief recap, check out “Things I wish I’d known about long-term world travel before I quit my job”. The future is Asia. The writing’s on the wall almost everywhere we look: there is absolutely no place on earth that can match the pace of progress in Asia. Yes, there are also risks, of course. Those who follow the news know that Thailand is not immune to political turmoil. But the fundamentals of life and work availability have not really changed in decades (no matter what set of politicians is ousted). And foreigners are generally safer living in Bangkok than they are in most American cities. No other part of the world that we visited in 2013 can match the frenzied pace of progress and the giddy optimism of Asia. Everywhere you look, there is construction. There is an obsession with education and advancement that absolutely blows the US and Western Europe out of the water in comparison. It may upset some to hear it, but it is true: the 21st century is the Asian century. The balance of world opportunity, wealth and influence has shifted East. For Millennials it makes a lot of sense to follow this trend and go where the opportunity is. More updates to come. We are home with family in Los Angeles for the holidays and head back to Thailand in January. Do you have any tips for us as we tackle our first longer term relocation? Hit us up in the comments.